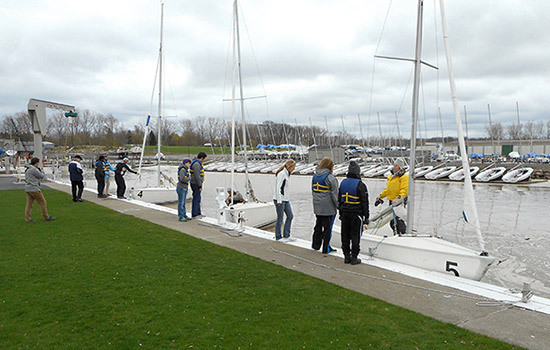 “The Meaning of Things—in Three Objects” class set sail at the Rochester Yacht Club April 22. The nine-credit immersion course, taught by three RIT faculty, explores three objects (the harmonica, the game and the sail) as a way of critically examining the world. Previous field trips included The Strong National Museum of Play and at Lovin’ Cup, where students played the harmonica with a band. The course is offered through the School of Individualized Study. Take three objects—the sail, the harmonica and the game—and create a nine-credit immersion general education course that would be the first of its kind at Rochester Institute of Technology. “The Meaning of Things—in Three Objects” made its signature debut this spring and the curriculum offers a truly interdisciplinary experience that develops strong critical thinking skills by spanning traditional academic boundaries. The pragmatic purpose from a student perspective is to fulfill the nine-credit general education immersion requirement, which all students must complete, in one truly immersive single-semester course, as opposed to the usual three separate courses stretching over multiple semesters. The course encourages critical thinking/entrepreneurship—where students study three objects (the sail, the harmonica and the game) and reflect on their design, history, social and cultural past. Key learning outcomes included applying the objects on broader social and historical contexts, examining their consequences and impact on human experience and assessing design problems they pose and solve. The Meaning of Things was taught by three primary faculty: Thomas Hanney, senior lecturer in the School of Individualized Study and local musician who plays the harmonica; Al Biles, professor in RIT’s School of Interactive Media and the Center for Media, Arts, Games, Interaction and Creativity (MAGIC) and notable jazz/trumpet musician; and Mike Johansson, senior lecturer in the College of Liberal Arts and avid historian and enthusiast of sailing vessels. According to the faculty instructors, all three are present at every class. They also participate in group activities for the students that included “sailing” small boats across RIT’s Clark Gym, playing harmonicas at Park Point’s Lovin’ Cup, a tour of the electronic game collection at The Strong/National Museum of Play, a board game night and sailing along the Genesee River with the Rochester Yacht Club. Faculty from across RIT who were involved in the development and support of the Meaning of Things—in Three Objects were: Professor David Neumann, College of Liberal Arts; Professor Mark Indelicato, College of Applied Science and Technology; Assistant Professor Mindy Magyar, College of Imaging Arts and Sciences; and Professor Babak Elahi, College of Liberal Arts.